If you're old enough to remember Christopher Walken's classic "Need more cowbell" sketch on Saturday Night Live, thanks in advance for your indulgence. 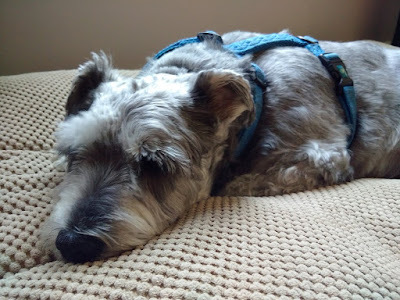 Just as the basic premise then was that more cowbell was always better, likewise more dog - in this case, our snoozing schnauzer, Frasier, but really any dog will do - is always a righteous thing. Life as we know it is never easy, and the outside world has a nasty habit of sticking itself into the quiet places where we once found refuge. Yet just when I think there no way to escape the chaos churning just outside, I happen across this little guy and realize he's already figured it out. More dog time is definitely called for. More dog photos, too. Does that work for you, as well. Dogs are better than therapists and sometimes cheaper. It totally does! Probably one of the reasons I have three dogs and one kitty-cat! It explains so much! Yes, my dogs are nicer than my family. Dogs become a member of the family--that's for sure! Fun!! Worried about digital privacy? You should be.